I could not have picked a better place for my grand dog. He is 17 years old and had surgery on his leg about 4 years ago. They recommended an excellent orthopedic doctor to do the surgery. He did great. Now he is have trouble walking with his back legs and we take him to Gray fox for laser therapy. Excellent animal hospital everyone is friendly and nice also. Would highly recommend it to everyone. He’s always cheery and very helpful. He cares for both of my chihuahuas. 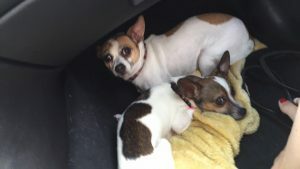 ( Toda and ruger)This weekend they did amazing for fitting me in for an emergency after keeping my dog at red bank animal hospital over night for liver disease problems. They are really good with prices and helping you understand what is going on. Our family really does appreciate everything you do for us and taking on all our emergencies since ruger loves to be our problem child 🙂 thank you again. We love Gray Fox and trust them to care for all our little “children”! The entire staff is attentive, courteous, compassionate and very, very knowledgeable. Thanks to everyone there! Love, The Chapman’s – Bentley, Brandi, Gizmo, Mylo, Lexy and Princess Sasha (and their Mommy and Daddy, too)! I have been going to Gray Fox for 25 years. It’s not the closest to our home in Erial, but we would not consider going anywhere else. Over the years they have treated all 9 of our dogs…ranging from 3-90 lbs. They have always kept them healthy and happy, and when the time came, helped them cross over with with the compassion I feel that they would show their own pets. I’ve been going here with my pets for close to 30 years. The docs and staff are friendly, knowledgeable and caring. We ❤️ Gray Fox!!! Comments Off on We Love Gray Fox! Thank you tol Dr.Lee and ALL the staff for making our Nina so comfortable during her recent surgery and hospital stay. She is doing so well now at home! You saved her life, and for that we are eternally grateful! You are the best! All so very friendly also pit bull friendly u don’t find alot of that they were so great with my bluie who I rescue at two weeks old also great with my husky mika. 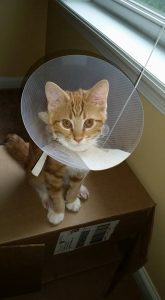 Thank you so much for taking such wonderful care of my kitten Cheddar after his accident. He’s feeling so good today that he’s running and playing again. I’m very careful to who I trust my pets/family to. Gray Fox has taken care of everyone of my pets since I was 5. They’ll do all they can for you. The whole office is FABULOUS!!! Dr. Lee Spector is the best!! Caring, loving, gives you MORE than what you would expect from a vet. The whole office is FABULOUS!!! Comments Off on The whole office is FABULOUS!! !